Nomad Temporary Housing was founded by one of the pioneers of the temporary housing industry for nomadic travelers like you, to provide the widest possible choice of accommodations in the world. Nomad is the only independent operator of temporary apartments that combines the full service of an international temporary apartment company with the myriad of locations from over 1000 quality temporary apartment providers in Nomad’s network, 11,000 different apartment properties, and a total of 145,000 apartments. We provide you with unbiased options based on criteria you select. We place you where you wish to be at the rate you need, versus the competition placing you where it is convenient for them. Our full service offering begins at the time of your rental request. Nomad’s reservation team conducts a “Nomad Needs Assessment" with you. We verify your specific requests when it comes to the important decision of selecting a temporary apartment. Is it location, price, or a particular apartment community? Arrival date or something else? Whatever your needs may be, they drive the apartment options we provide. We feature beautiful garden style apartments in Los Angeles, sleek high rise accommodations in Shanghai, New York or Vancouver, and traditional townhouses in London. Nomad has regional offices located in California, Hong Kong and London. Unbiased Selection, We give you options tailored to your needs, whether that is a specific arrival date, placing a group all in one building, or the lowest possible price point; whatever you desire. We can do this because we have no commercial interest in any property option we provide. We have no bias to our own apartment inventory, because we carry no inventory. In this regard, we are unique, and we work for you. We never force you into options to fill existing vacant apartments, simply because we don't have any vacant apartments. Price Advantage, We scour the market for the best possible pricing at the time of reservation. Our proprietary multiple bid system seeks out un-rented temporary apartment choices among quality providers. You receive the best possible prices due to our bid system, Nomad’s keen knowledge of each area’s rates and costs, and the negotiating prowess of the Nomad team. Choice, You receive the price and location choice of hundreds of apartment providers, under the auspices of one firm as we have aggregated the temporary housing industry for you. You can rest easy and deal with one company for all your temporary housing needs. From one stay to thousands per year; we provide a centralized point of contact for quality service, customized billing, 24/7 communication, and arrival and departure services. Our firm is based on one simple premise: To serve the needs, wants and desires of our nomadic customers. Our Vision, Mission and Value statements reflect this core ideal. To be the finest independent and unbiased provider of temporary housing accommodations in the world, offering the best choices for our customers, putting their needs above all else. Nomad will provide our customers with unparalleled choice when selecting temporary housing accommodations, at competitive rates via our proprietary bid system. Nomad will provide the superior service of one centralized company, providing one point of contact, one invoice, and fanatical attention to customer satisfaction. Nomad will carefully select apartments and partners to insure service is consistently exceptional. Nomad is independent and unbiased. We are not bound to our own properties or leased apartment inventory, as we do not carry any long term leases. This will insure our offerings are always in the client’s best interest. Customers: Our customers have our supreme focus. This includes the clients who place business with Nomad for their employees, as well as the valued guests who stay with us. We listen to our customers every step of the way. Service: We provide the superior service our customers deserve and demand. Nomad will consistently exceed expectations. We will respond to any issue in a timely manner and resolve problems in the best possible fashion. We take the stress out of being a Nomadic traveler. Associates: Nomad is founded on dignity, respect, and appreciation of our associates in the firm. We believe in a fun and enjoyable work environment. Each member of the team is empowered to handle any client need, instantly. By treating our associates with the highest regard, we will serve our customers the same way. Nomad Certified Partners: Nomad will work only with quality temporary housing provider partners, firms that are renowned for service and quality. Nomad will treat these firms as valued partners, and create mutually beneficial business relationships. Technology and Innovation: We are at the leading edge of the industry. We provide useful tools to insure stays with Nomad are stress free and enjoyable. For client contacts, we provide the detailed information, reports, and solutions that demonstrate Nomad is truly a strategic partner, not just a supplier. Integrity: Nomad will operate with the highest level of integrity. Our unbiased and independent placement of our clients’ housing requests will always be fulfilled based on the customer’s requirements. We will never offer choices based on commission rate, or other incentive. Community: Nomad encourages both industry and community service by our associates and partners. Nomad strives to improve the temporary housing industry and the communities where we do business. Nomad charities of choice are The American Red Cross and The Doctors Without Borders. Nomad was founded to provide the highest level of service and quality, along with the widest possible choices of housing in the world of temporary accommodations. Our commitment to service is constant, and we are always raising the bar internally, and within the industry. Our amazing associates understand the stressors involved in relocation and business travel, and do everything possible to mitigate the added pressure for each of our guests. Nomad’s leadership has been active in the temporary housing and relocation space for decades. At its core, Nomad is a service company, that provides accommodations. We have a servant’s heart. Our needs assessment is very thorough, and starts with the needs, wants and desires that are important to you. What is at the top of your mind? School district? First floor to accommodate a stroller? We will make it happen. Our properties and apartments have been carefully selected and thoroughly inspected prior to your arrival to insure they are ready for you on arrival. We are here to resolve any problems during your stay. We quickly respond to your service requests and keep you updated until completion via sophisticated customer service software, continuous associate training, and partnering with service oriented suppliers. There are no paper forms required at the time of booking, all our agreements feature electronic signature options, making it easy to complete the rental agreement while you are on the go. In addition to Nomad's associates, we have industry associates around the world who set up the apartments, provide housekeeping services, and attend to maintenance requests during your stay. These team members are part of our Nomad Certified Partner network. We are the first international temporary housing firm to provide star ratings to help you choose the right level of property to fit your budget and situation. As we say, from practical to palatial, we have you covered. We listen to our customers, and use the feedback to optimize our service, and for continuous improvement. We believe in customer surveys during stays, and regular feedback sessions from our corporate clients. All associates at Nomad are empowered to resolve service issues; we know the value of handling issues right the first time, and on time. Nomad is the first international temporary accommodations firm to rate apartments via a very defined and specific star rating system. It allows prospective guests to truly make an educated decision on their housing, without actually touring before their arrival. The apartment community or building is less than eight years old, or it has had a 100% interior refit in the last five years. Secured entries with a 24/7 concierge to address your needs. Accommodations include upgraded apartment furniture, sleek appliances, granite or marble countertops, stylish carpets, and floor finishes. Other amenities include a washer/dryer en-suite, flat screen televisions, fine linens, wireless internet, all in highly desirable neighborhoods. The community is up to ten years old, or up to 15 years old with at least one full renovation in last 7 years. Full renovation includes new appliances, carpets, and flooring. Amenities include upgraded apartment furniture, flat screen televisions. Additional items include secured entries, high speed internet, washer/dryer en-suite, and fine linens. Properties are located in highly desirable neighborhoods, including key suburban locations and central business districts. The community is up to twenty years old, with at least one full renovation in the last seven years. The amenities include mid-range furniture, linens, and a complete housewares package. Washer/dryers are usually included, as are secured entries. High speed internet access is available. These properties may be found in central business districts or suburban locations. Often found in large well established areas of historic cities such as London and New York, these properties are built within the last 70 - 100 years, with various forms of renovation. Many guests view these locations as quaint. Furnishings and housewares are limited, however the basics are included, from utilities to cable TV. Nomad will not list these properties on www.nomadtemphousing.com as they are unable to meet our service and quality standards. Gavan James, the founder, president, and CEO of Nomad Temporary Housing is truly a pioneer of the temporary housing industry. Gavan's vision for a new type of temporary housing company came to life in 2010 when he formed Nomad. He has developed Nomad into one of the world's largest industry providers along with his fellow partners, Karl Thuge and Heather James. After a very successful 30 year period at Oakwood Worldwide where he oversaw all worldwide operations as Senior VP and GM, he launched Nomad to be the only unbiased worldwide housing solution available. One of the most well known and respected figures in the temporary living field, Gavan has been an integral part of the industry’s growth via the formation of the Corporate Housing Provider’s Association (CHPA) in 1996. He was one of seven founding board members of CHPA, and is a current board member. He has served as CHPA’s President and Vice President over the years, and was the organization’s “Person of the Year” in 2003 and again in 2017. He holds the designation CCHP, Certified Corporate Housing Professional. Gavan is married to wife Heather, with three daughters - Ashley, Hannah, and Amelia Rose. They reside in Rancho Santa Fe, California. Karl Thuge is a seasoned relocation professional with over twenty years of relocation industry experience. Karl is one of the most respected and recognized people in relocation, after previously leading business development for two Fortune 100 firms. 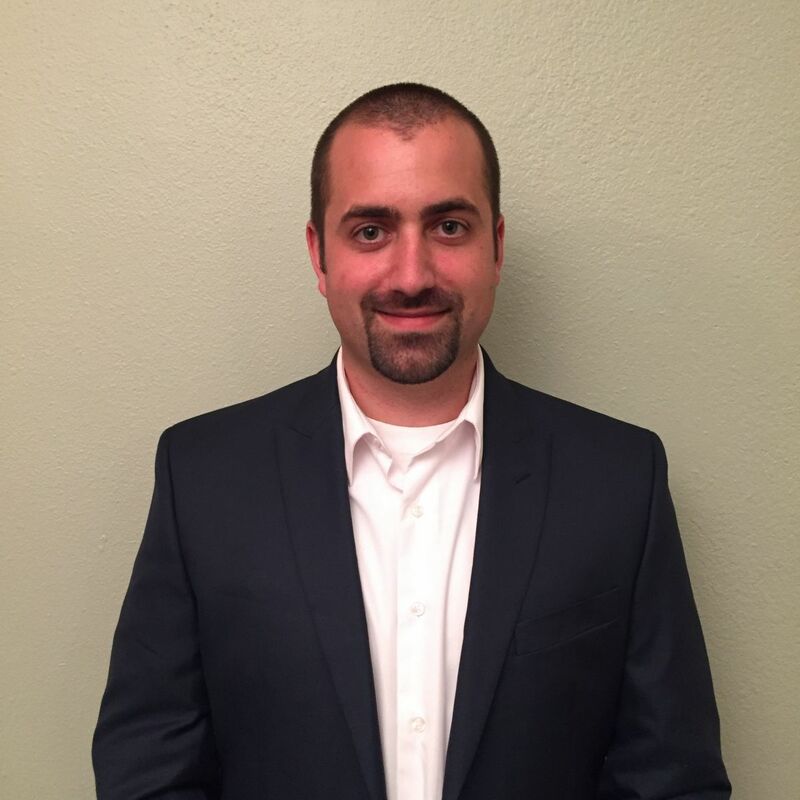 Karl leads all of Nomad Temporary Housing’s business development, account management, and marketing programs. Before joining Nomad, Karl most recently was senior vice president of Bank of America’s mortgage division. Prior to his career at Bank of America, Karl was senior vice president of GMAC Mortgage of Troy, Michigan, where he managed GMAC’s national relocation business programs. 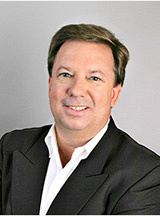 Preceding his role at GMAC, Karl was chief operating officer of Corcoran.com, working with Barbara Corcoran of New York City. Karl holds the designation of certified relocation professional from the Worldwide Employee Relocation Council (WERC). Karl works in Nomad’s satellite office in New York City. Karl resides in both Manhattan, and Long Island, New York. Heather James is an integral part of the development, growth and retention of clients at Nomad Temporary Housing. Her acute focus on the client and guest experience reflect Nomad's vision to "offer the best choices for our customers, putting their needs above all else". 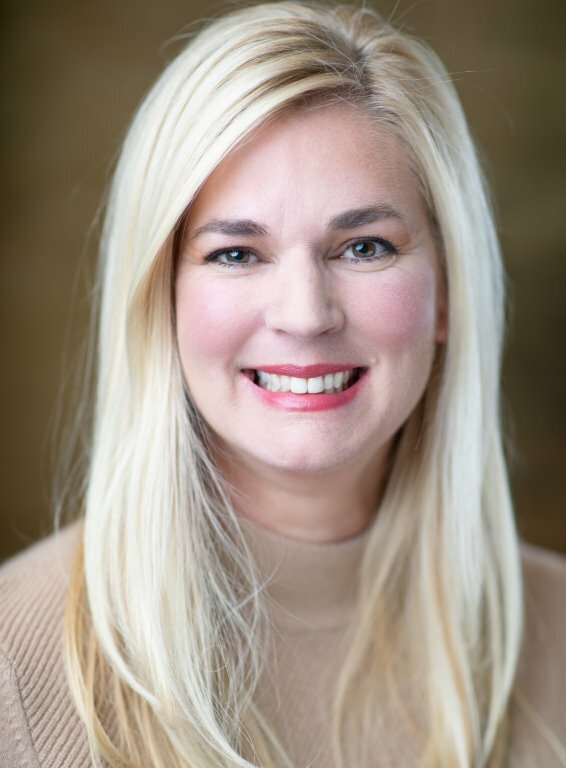 As a longtime veteran in the world of global mobility, Heather's relocation career began in the early 90's and spans the furniture industry, corporate housing, lending, mobility management and global banking services arenas. Heather's passion for the business and for building quality relationships with clients and colleagues is the cornerstone of her success. Prior to formally joining Nomad, she served as vice president with Citibank, offering strategic global banking solutions to multi-national organizations and their employees. Heather highly values her association with Worldwide ERC, and has earned both the Certified Relocation Professional and Global Mobility Specialist designations. She is an active participant at a national level, as well as with several regional groups, currently serving on the board for BAMM in the San Francisco Bay area. A native Floridian, Heather relocated to Southern California in September of 2004. She lives in Rancho Santa Fe, California with her husband, Gavan, and daughters Amelia Rose, Hannah and Ashley. Frank Peralta is a 20 year seasoned professional of the hospitality industry where operations management was his key responsibility. 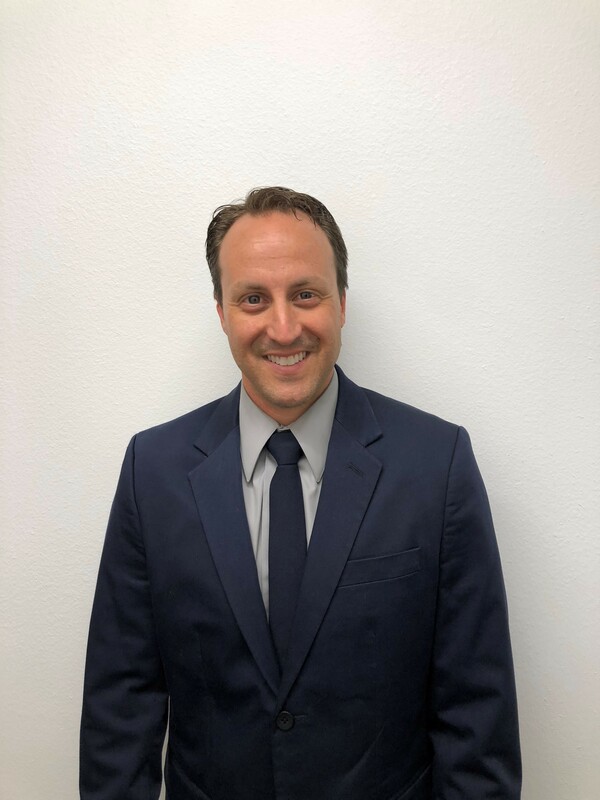 Frank’s career has been built on his passion for exceeding guest’s expectations, building a team that is empowered to make decisions and always finding ways to improve operations, that at the end of the day, benefit the guest experience. Before joining Nomad, Frank worked for the Hyatt Hotel San Diego as part of the operations team managing the nightclub and restaurant operations. Prior to the Hyatt, Frank was the director of beverage for the Hard Rock Hotel San Diego managing events, outlets, and guest service. Preceding his role at the Hard Rock Hotel, Frank was the director of operations for House of Blues San Diego managing the events and operations for this venue and previously for the Las Vegas and New Orleans venues. Before his time with the House of Blues, Frank was on the opening team for the Hard Rock Hotel Las Vegas working for the guest service & box office operations team. 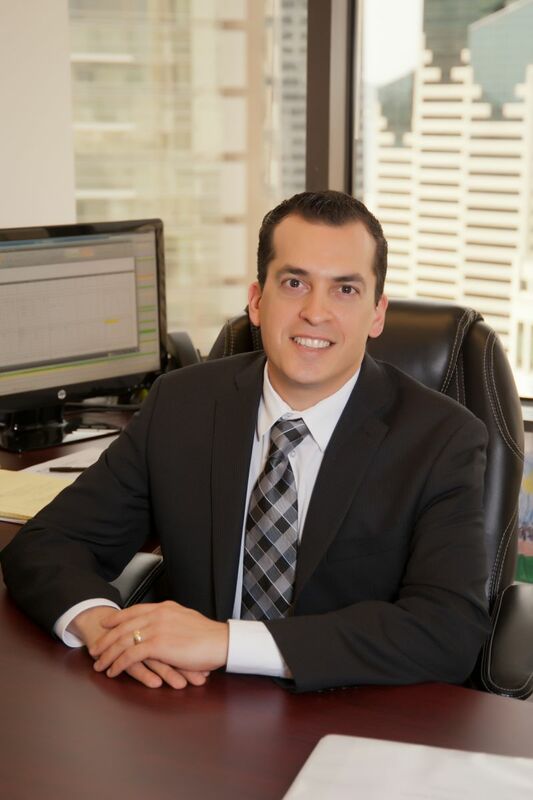 He is also a UNLV alumni with a Bachelor of Science Degree in Hotel Management. Kevin Kembel brings a wealth of client management and relationship development experience to his director role at Nomad. His focus on building and improving Nomad’s current client base as well as developing and growing new relationships is acute. Kevin also manages several major accounts and creates raving fans on a daily basis. Kevin comes to Nomad from the Patrick Lilly Team at the prestigious Corcoran Group Real Estate firm in New York City, where he was a Senior Associate. His team was consistently recognized as one of the top-producing teams in the U.S. by the Wall Street Journal. Working with high-profile and high-net worth individuals, and attending to their unique demands, was the hallmark of how he managed his business and developed strong client relationships. 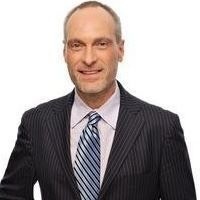 Prior to his nearly ten-year career in the highly competitive New York real estate business, Kevin served as Director of Advertising at AT&T, where he oversaw all advertising activity for the DSL High-Speed Internet Service product. Additionally, he has held positions with major global companies JPMorgan Chase, Ogilvy & Mather and Wunderman/Y&R New York. 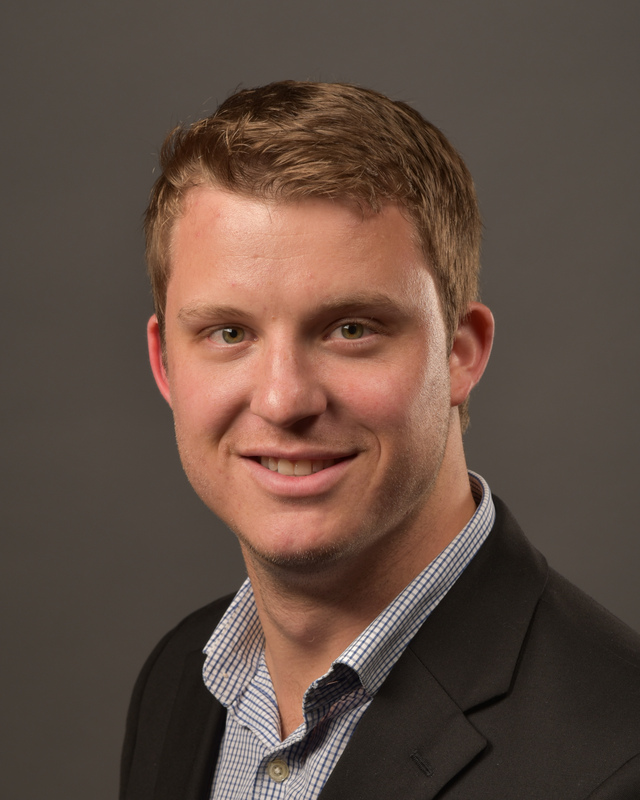 Graduating with a BBA in Finance from Abilene Christian University, Kevin’s varied experience in the fields of corporate finance, advertising and real estate bring a unique skill set to Nomad, and to the temporary living industry. His sense of humor, stellar business ethics and innate ability to address client needs quickly and effectively, earns him the trust and respect of both peer and client. Kevin resides in La Jolla, and enjoys all the great things about living in Southern California, including spending time on the beach with his black Lab, Izzy. 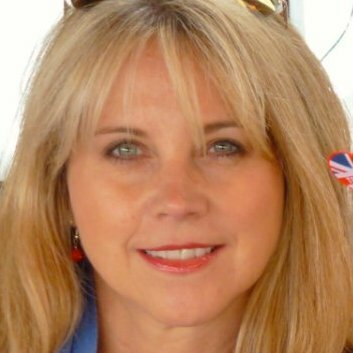 Patti Whittle manages the EMEA office as the Director of EMEA Operation based in London. Having been transferred to London in the autumn of 2000, Patti brings to Nomad her personal knowledge of relocation both within the US and internationally. She overseas supply chain management for the EMEA region, reservations, guest services, and account management. Patti joins the Nomad team with over 14 years of serviced apartment and management experience. She is the former District & General Manager of Oakwood United Kingdom in London. In that position, she played an integral role in the growth of the fledgling office. She was also the District Manager for Oakwood's operations in both Atlanta and Chicago earlier in her career. Although Patti was born in Georgia, she has been relocated no less than 13 times throughout the US, Germany and the UK. She currently resides in a London suburb with her husband Jon and their daughter, Annabelle. Aaron Bixel oversees the Accounting Department of Nomad Temporary Housing. Aaron came to Nomad from AT&T, where he was also an award winning producer and leader. He was a recognized top performer with a penchant for exceeding expectations to ensure an exceptional customer experience. Aaron came to Nomad managing the guest services department and elevated the service level in every environment due to his ability to invigorate his teams with his passion for excellence and an empathetic client approach. This ability, to inspire his team to emulate his philosophy of service delivery, is crucial to his success. With his attention to detail, and passion for numbers, alongside his degree in accounting, he has since moved into managing Nomad’s finances, payroll and accounting staff. Aaron earned his Bachelor of Science in Accountancy from San Diego State University. He currently resides in Rancho San Diego with his wife, Ingrid, and their three children: Jakob, Valerie and Preston. 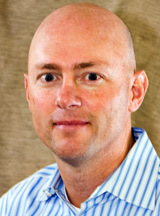 Matt McBride manages the supply chain of worldwide Nomad Certified Partners. In his previous role as Guest Service Manager, he dedicated his efforts in building professional relationship with our partners on a daily basis. His candidness and ability to foster quick rapport with guests has made it a seamless transition into the supply chain role. Matt came to Nomad with 12 years of hospitality experience in the bar & restaurant industry. He exceled quickly and made a name for himself in the industry as a leader and motivator. In his years managing multiple locations, he built a reputation of developing strong teams that were highly engaged and that provided outstanding service delivery. Matt’s enthusiasm and passion for serving, and inspiring others to do so, is the cornerstone of his success. Matt earned his Bachelor of Science in Psychology from National University. He currently resides in Rancho San Diego with his wife, Marisol, and their three children: Madden, Mathison and Mace. David Janiszeski oversees worldwide reservations operations, driving service excellence on the front lines. Prior to the director role, David excelled in positions in both client relations and reservations management in the U.S. for Nomad . Before joining the organization, David was employed at AT&T Mobility, where he thrived in both sales and customer service. David exhibited early success with his ability to build rapport and exceed customers’ expectations with his personable and knowledgeable approach. After completion of his masters of science in educational counseling, David was recruited into management. He built a stellar reputation in a short amount of time, and became known for his leadership, motivation, and execution. During his tenure at AT&T, David and his team exceeded sales quotas year over year, a direct result of hard work, dedication and attention to the customers’ needs. David is originally from Buffalo, NY and in 2013, he migrated to southern California to avoid the harsh winters of the north. He now enjoys all of the year round outdoor activities that San Diego has to offer. Nomad Temporary Housing is headquartered in beautiful San Diego, California. Our corporate offices are located in Rancho Bernardo. We also have offices in Hong Kong and London. We are an international temporary housing firm that provides high quality furnished accommodations throughout the U.S., Canada, EMEA, APAC and selected locations in Central and South America. Nomad also has a satellite regional office in New York City. We value our associates, who are the true lifeblood of Nomad. Our people are dynamic, service focused, and empowered to serve our customers in an instant. We know our associates are the reason clients choose Nomad, and we recognize their importance. Applicants must have a passion for customer service, no matter what your role is in the firm. At Nomad, we put our customers at the front of everything we do. We have quality systems, training and support. Nomad is a newer firm, owned and operated by people who are experts in the field of temporary housing. Nomad Temporary Housing provides excellent compensation and benefit packages. All associates have incentives tied to customer service performance and business performance in addition to competitive base salaries. Nomad offers medical insurance, dental insurance, and a generous paid time off policy, and the opportunity to participate in a 401K plan. Nomad also promotes and rewards energy efficiency. Nomad Temporary Housing is an equal opportunity employer. Nomad provides worldwide accommodations via the Nomad Certified Partner Network. Our 950 certified partners manage or own over 145,000 apartments in over 11,000 distinct locations. These properties and partners have demonstrated they can meet our standards for exceptional service and adhere to a rigorous service level agreement. Partners are subject to site inspections by Nomad staff and numerous other quality controls. Nomad works with multiple quality partners in each market we service. This approach allows for a much wider choice in price, location, and apartments when compared to working with any one or two temporary apartment operators. We have had relationships with most of our partners for many years, and we are all committed to serving our valued guests and clients. Nomad serves North America, EMEA, APAC, and South America. Nomad associates and our partners are always near your temporary apartment with a collective staff of 9,000 housing professionals. Whenever you need us, we will be there. With Nomad, it is not a desert out there, you are not alone. "Nomad Temporary Housing is my procurement department's dream." Senior Relocation Director of one of America’s largest entertainment conglomerates, regarding Nomad’s proprietary reservation bid system that seeks out the best market rates every day. "Nomad's founder asked me to review their business plan before they launched. The model of unbiased selection was very innovative, and a market disrupter. When Nomad opened, we tested out the concept. Since then, we have been extremely pleased with their execution of unbiased options, superior rate variety, and their high service level. We have been thrilled using Nomad. They truly aggregated the temp housing industry"
"I just love Nomad, it is especially appealing for my summer interns." Senior Relocation Manager from one of America’s largest IT hardware manufacturers in regard to Nomad’s unique ability to house large intern groups by consolidating the inventory of numerous partners in the fewest possible locations. "We’re all very excited about the opportunities to build our partnership with Nomad. We appreciate all you do to make our jobs a little easier, but still give us confidence that we’re offering high quality options." Relocation management company consultant regarding Nomad's ability to source broadly on her client's behalf. "I give Nomad two thumbs up!" Vice president of a mid-size and growing relocation company after seeing how Nomad can give his clients multiple options and save time for his relocation counselors. "So far everything has been just fantastic.....the serviced apartment is just superb. Thanks for everything. You are a super star. Moving into a new country was made super easy thanks to you....."
International Nomad guest commenting on his service experience with his reservation coordinator. "Nomad is groundbreaking. Your firm revolutionizes the temporary housing industry. Your technology is very, very innovative." Senior relocation manager of Fortune 50 Technology Firm referring to Nomad’s “industry firsts”: technology offerings, service capabilities and controls, and business model that aggregates the highly fragmented temporary housing industry. "Thanks, Joanna! It was fantastic and we enjoyed New York a lot and it helped us settle into the new place very quickly. I appreciate all the help you have given us throughout our stay. It was not easy coming in to a new place but thanks to you it was pretty easy to acclimatize to the US"
Fortune 100 guest complimenting his reservation manager. Designed with our guests in mind. Our mobile app provides the ability to search properties, book apartments, view arrival instructions, map directions and submit service requests, all encompassed in one place. Download in the Apple Store today! Nomad employs leading edge, yet proven technologies to provide the best possible level of service to our clients and guests. Our goals for our valued guests include providing a simple rental process, a wonderful arrival experience, and an easy, problem-free stay. On the client side; we insure you receive the information you need, the reports you need, and the billing format you need, all when you need it. Nomad’s website is more than photos and text. This website holds reams of data for each of our 11,000 properties. We use this data to select the best possible rental option for our clients. With www.nomadtemphousing.com you can send us a service request, request general information, and learn about your new temporary home and it is surroundings. Our robust website has also been designed for ease of use and navigation. OSCAR is the leading corporate and temporary housing software application available. It provides property management, financial accounting, reservation systems to manage Nomad’s worldwide rental capabilities, and numerous other business applications. We have the ability to bill in numerous currencies (VAT certified), bill daily, weekly, or in 30 day increments. Our systems handle credit card processing accurately and securely. Our system also manages multiple roommates, block rentals, and all key guest/client information. Nomad employs NomadTrack, a state of the art CRM system that allows our associates and leadership to track, handle and follow up on every service request of any nature, worldwide. From a simple request such as providing a receipt, to handling an urgent air conditioner issue in 100 degree heat, NomadTrack communicates issues instantly. NomadTrack communication technology updates guests via text messaging, email and voicemail to keep our guests well informed until any request is resolved. Nomad is one of the first corporate housing companies in America to deploy all software on established servers off-site with one of the world’s largest IT server farms. This IT option provides numerous redundancies, 99.97% uptime, instant 24/7 worldwide access for our staff members, and unmatched security. Our platforms meet all of the latest security, disaster recovery, and redundancy protocols called for with our relocation, government and private industry clients. All information and entries are backed up daily, many back ups occurring with each keystroke. Embedded in our website, property descriptions, and all arrival documents is a link to NomadSearch. NomadSearch is a premier tool for all of your questions on living like a local in your new neighborhood. Nomad developed this tool to provide useful and current information on your property’s area restaurants, schools, nightlife, DMV offices, points of interests, and practically anything else you can imagine. To begin, search for properties on our website and go to More Information, Area Map. Nomad Temporary Housing features temporary apartments in high-rise or mid-rise apartment communities and condominiums. These apartments and condos are either four or five star levels. Many buildings feature the benefit of a 24/7 doorman or concierge to serve you. These properties are generally located in large urban settings, city downtown zones, and occasionally in greater metro locations. Nomad has high-rise locations in New York, Chicago, San Francisco, Miami, London, Vancouver, Los Angeles, Atlanta, and Toronto. These fine properties often include city views from upper floors, and are often conveniently located near major employers and public transportation. Most locations in New York and London do not include car parking. Car parks are nearby, though they can be pricey. Today’s garden style temporary apartments are not the square, flat roofed boxes from a generation ago. Nomad’s four star and five star properties feature quality style and architectural details found in fine homes. These properties may have stairs up one level, but many have elevators, as many are three to five stories tall. Parking is included in most locations, often in garages adjacent to your home. Interior appointments include upscale furniture, designer kitchens, en-suite washers and dryers, and most are gated communities. Recreational amenities vary by region, but you can expect fitness centers, pools, and club rooms at 90% of our locations. Temporary apartments are known as serviced apartments outside of the United States. International locations are also a little more hotel like, as most provide a 24/7 front desk or concierge for your service. Also for your convenience, the majority of our international locations are available for rent by the day or week. The building styles and architecture vary widely; many are high-rise style communities similar to what you would find in New York or Chicago. You will also find overseas locations in beautiful buildings from a different period. Our wonderful townhouses in the Kensington neighborhood of London may have been built 200 years ago; however, they have been totally renovated and now feature modern interiors. Whether you are in a sleek high-rise in Vancouver, or in a stunning building in Paris, interior accommodations remain pretty consistent with quality furnishings, linens, kitchen items and the like. You can expect more frequent housekeeping services in some countries. While weekly housekeeping is the standard in most cities, some have daily housekeeping services. Recreational amenities vary widely, from no amenities at all to virtual adult playgrounds with unusual features such as climbing walls, saunas, and yoga instructors. Nomad Temporary Housing offers quality housekeeping upon request. You're staying for a month.....how about some help caring for your temporary home? Nomad provides exceptional housekeeping services to keep your place in tip top shape. Our associates have made your apartment home ready for your arrival, and they are here for you during your stay. Housekeeping services can be provided on any interval you wish for an additional charge. Weekly housekeeping services are the most popular, some guests prefer bi-weekly. If you have not ordered this service prior to arrival, and would like to add it, please call us at 866-282-4750, or email us at service@nth.com. We have compiled a list of Frequently Asked Questions, click on the question to see the related answer. If you can't find the question here, contact us. Temporary housing, also known as corporate housing (and serviced apartments internationally), is a niche lodging segment providing temporary accommodation needs for 30 days or longer. Unlike a hotel, temporary apartments are located in residential apartment communities where the short term apartment is next to neighbors who reside permanently at the community. Complete apartment furniture package, including living room furniture, dining furniture, bedroom furniture, artwork, televisions, and small kitchen appliances. Linen and bedding packages including towels, sheets, comforters, blankets, and pillows. House ware items such as dishes, cookware, silverware, and other needed items. Electric, cable TV, high speed internet, and telephone service included. Fully serviced, Nomad handles any issue that needs attention during your stay. Who is Nomad Temporary Housing? Nomad Temporary Housing is an independent provider of temporary housing for 30 days or longer. We have one of the largest selections of temporary apartments in the world. We work with over 950 quality partners providing 145,000 apartments in over 11,000 property locations around the world. This unparalleled selection gives you the exact apartment you desire, at a price that meets your budget. Why should I choose Nomad over other temporary housing providers? Nomad is the only full service, yet fully independent provider of temporary housing. We do not carry our own long term apartment leases or carry our own properties in inventory as others do. Instead, we work with numerous quality partners in each market we serve to provide you a much wider array of location and price choices than any one traditional temporary housing company. Others may only offer what they have as a vacant unit the day you call, without regard for your neighborhood or budget request. We find you what you want, where you want it, and when you want it. Nomad provides you the choices of many apartments from quality partners, while remaining your one point of contact throughout the process. We handle everything from your reservation request to all of your needs during a stay, as well as all billing and payment arrangements. Nomad operates as a five star service provider. We are here to serve your needs 24/7. Our associates have been carefully selected, trained, and have a passion for hospitality. The Nomad Certified Partner network has a combined staff of over 9,000 associates dedicated to providing and maintaining quality accommodations when, how, and where you need them. Nomad's Certified Partners were carefully selected from years of experience rating their service and products. In addition, each adheres to rigorous Nomad standards as outlined in specific service level agreements. Nomad uses the latest technology to insure stellar service response. Our NomadTrak software tracks any problem you may encounter or need you may have during your stay. This includes a receipt request, a clogged kitchen sink or even a noisy neighbor. Requests are handled promptly, and NomadTrak allows you to receive progress updates and completion updates via text, email, or phone. NomadTrak also provides updates to company management, and even to client contacts if needed. What else makes Nomad a better fit for me? Nomad’s locations and website (www.nomadtemphousing.com) are linked to NomadSearch to provide a huge array of information about the area around your Nomad temporary home. We conduct an assessment to find your “Needs, Wants and Desires” to provide you with the perfect temporary apartment. Are you looking for a special area or apartment community? Do you need a certain school district location for your children? Do you desire a bottom floor, or a top floor? With our access to numerous partners in each market we service, we will find you great options! For our corporate clients, we can provide one point of contact for all of your needs with a Nomad account manager and consolidated billing for every location. We can even manage multiple roommate billing to individual departments. Nomad is paperless. Nomad features all electronic signatures to make your rental and departure agreements stress free. No printing, signing and faxing or scanning of forms. In addition, very large fines can be levied to guests for smoking in a unit designated as a smoke free zone. Absolutely! Nomad is the only company that sends your reservation request out to numerous quality providers in the area you wish to reside. Many of our partners have leased apartments in the same high quality communities, yet their individual rates vary based on occupancy levels. As a result, you benefit from firms offering a lower price to fill an apartment as Nomad passes these savings on to you! What is the difference with a Nomad apartment vs. a hotel/suite hotel? Nomad’s temporary apartments are in actual apartment communities where your neighbors are permanent residents, instead of a hotel guest in the room next to you who stays an average of three days. These residential properties are home, not home like. You can get comfortable for a month or two, or a year or two. Hang your photos, decorate and really “move in” during your temporary stay. Nomad’s corporate apartments are less expensive than any business travel hotel. They feature full size kitchens, with a wide array of kitchen items made for real cooking, not just a microwave, like you find in a suite hotel kitchenette. Almost all of our apartments feature a full size washer/dryer, as opposed to a cramped laundry room at a hotel. Each bedroom and closet is home size, not hotel size. Large queen beds and ample furniture are standard, and a separate living room truly gives you room to stretch out. When you have a short term stay, or a housing need in a remote area where no temporary apartments exist, Nomad works with quality suite hotel brands to provide you with the best options available. Nomad spends tens of millions of dollars per year with these housing brands, giving us enormous buying power. We leverage this and pass the savings on to you. We will find you the best possible housing choices, for a day, week, a month or longer. Most locations require a 30 day minimum stay in North America. Outside North America, most locations are available for less than 30 days. Where are Nomad temporary apartments located? Nomad has over 74,000 temporary apartments, townhomes, and condominiums in 11,000 locations in every major market in the world. What is included in a Nomad Temporary Housing apartment? Nomad provides everything you need for living and working. The apartments have a wide array of furniture, housewares, linens, electronics and artwork. All utilities are included, as is cable TV service, high speed internet, and basic telephone service. Housekeeping is standard in some areas such as London; however it is optional in most areas. Long distances calls are an additional cost. Parking is free and included at most locations, but can be optional or an extra fee in certain cities such as London and New York. What kind of properties does Nomad have in its portfolio? Most of our locations are in upscale apartment communities built in the last 5-12 years. Suburban areas feature mostly three or four story garden style apartment communities. These properties have a wide array of recreational amenities such as large swimming pools and spas, fitness centers, and clubhouses with additional amenities. Urban properties are mostly mid-rise or high-rise built properties, many with 24/7 doormen or concierge staffs. These properties occasionally have swimming pools, many have fitness centers and guest recreation floors. Practically all of our communities have some form of controlled access in the buildings and/or parking areas. Yes! Nomad offers pet friendly locations in every city we serve. Some locations have weight limitations or breed restrictions on certain types of dogs. Pet deposits are required and some locations also require a monthly pet fee in the rent to allow for the additional property care from pet occupied apartments. Are Nomad temporary accommodations smoke free? Most locations are smoke-free. However, even apartments that are designated to allow cigarette smoking may charge up to $400 at departure to remove the smoke odor from apartment furniture, carpeting, bedding and even walls. Smoking in a smoke free designated apartment can be even more expensive to recondition. Fifth continuous year for a #1 ranking from various Trippel surveys! 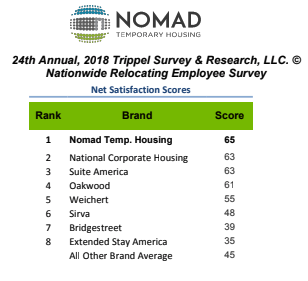 Nomad Temporary Housing is delighted to announce they have received the highest score in Net Satisfaction of any temporary housing or hotel brand in the 24th Annual Nationwide Relocating Employee Survey, conducted by Trippel Survey & Research, LLC. This is the fifth time Nomad has received a #1 ranking from Trippel in the last five years for either the Employee Survey, or Relocation Manager Survey. LAS VEGAS, March 26, 2019 /PRNewswire/ – On March 5th, 2019, RELO Direct presented Nomad Temporary Housing with a Service Excellence - Gold Award at the RELO Direct Corporate Forum. Omaha, Nebraska ─ Nomad Temporary Housing, Inc. is pleased to announce that it has earned the 2018 NEI Own It! award in the Temporary Living division. The NEI Own It! 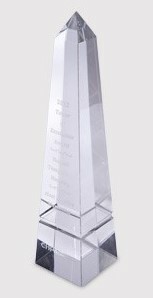 award recognizes the Service Partners who best exemplify the NEI business approach to providing Service Exceeding Expectations: Offering value, Winning the customer’s confidence, responding Now, not later, Inspiring others with a positive attitude and Taking full responsibility. Omaha, Nebraska ─ Nomad Temporary Housing, Inc. is pleased to announce that it has earned the 2018 NEI Service Exceeding Expectations award. The NEI Service Exceeding Expectations Award is presented to Service Partners by industry segment and is based on the highest percentile scores, as captured in NEI scorecard processes. SAN DIEGO, April 12, 2018 /PRNewswire/ -- Nomad Temporary Housing President and CEO, Gavan James, has been awarded the Individual of the Year (300 units or greater) by the Corporate Housing Providers' Association (CHPA). CHPA is the professional trade association exclusively dedicated to supporting corporate housing providers around the world. 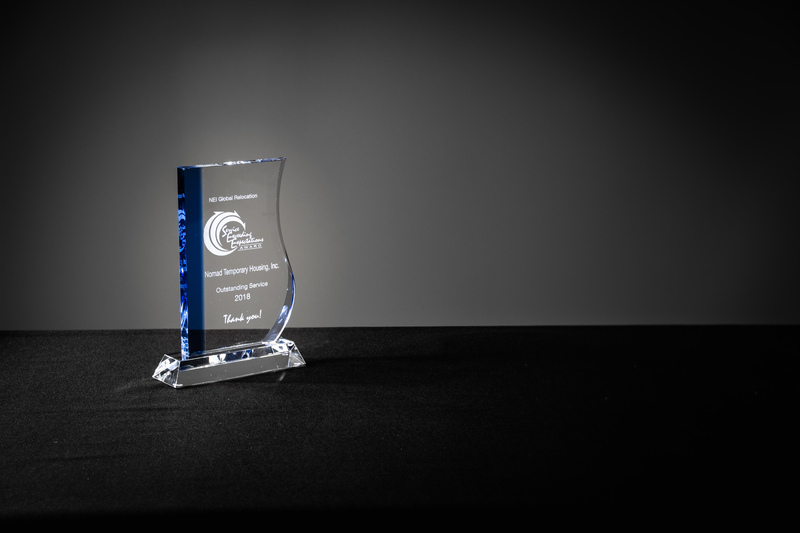 Every year the industry gathers for its annual conference and awards ceremony, where the recipients of the Tower of Excellence are recognized. PEAWAUKEE, Wis., March 6, 2018 /PRNewswire/ -- Nomad Temporary Housing is pleased to announce its recognition as a 2017 Partner in Quality by WHR Group Inc. WHR Group helps companies relocate their employees to new opportunities all over the world. With over 20 years' history of offering innovative solutions for clients, and concrete results for their top talent, WHR Group bases its success on creating long-term partnerships with knowledgeable, worldwide experts and strives to recognize these experts annually. 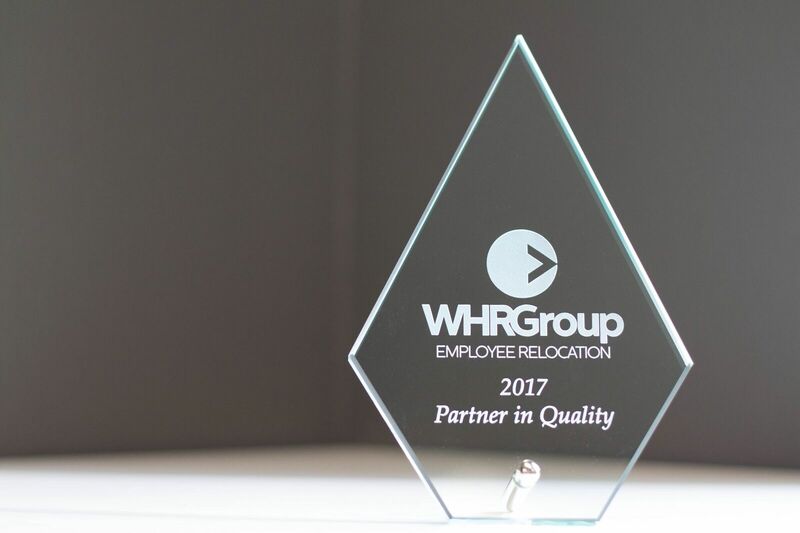 In granting these awards, WHR Group evaluates its Global Partner Network for partners that have exceeded commitments to customer satisfaction, supply chain management, service excellence, and overall cost management in the employee relocation sector. 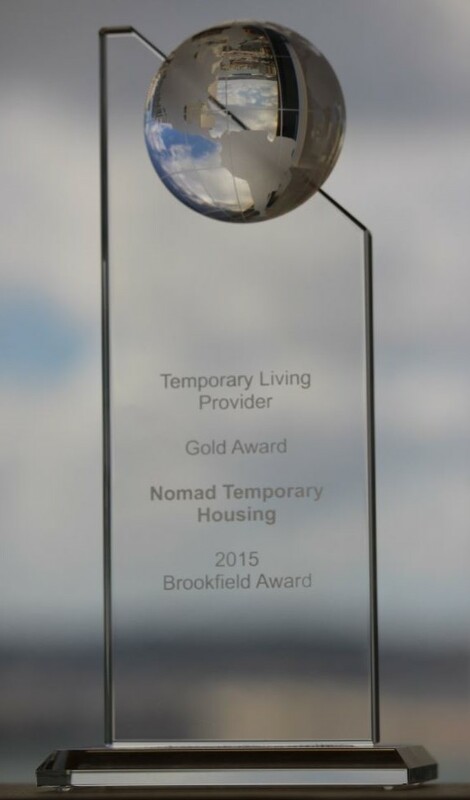 This past year was an exceptional one for Nomad Temporary Housing. Karl Thuge, Partner and EVP at Nomad states, "This award honors our frontline employees in reservations and guest services, and their long-standing commitment to service excellence. It acknowledges their efforts every day to make each guest feel like Nomad cares, the client company cares, and of course, that WHR Group cares about every aspect of the employee's relocation or assignment. Our team is humbled to serve, and very much appreciates the recognition!" SAN DIEGO, May 9, 2017 /PRNewswire/ -- On Thursday, May 4, 2017, the winner of this year'sCorporate Housing Provider of the Yearaward was announced at the FEM Americas dinner at the Denver City Center Marriott in Denver, CO. The FEM EMMAs are the premier awards for the global mobility and HR industry and following a highly successful two-day Summit, 200+ key figures, leaders and companies gathered to celebrate the brightest and best in the Americas. Judged against a strict set of criteria, the competition for this award was fierce, with nine shortlisted finalists. "Nomad offer a very innovative concept. Their suite of services and innovation drives results that provide direct benefits to their clients." "We are thrilled to be honoured with this prestigious award for the second year in a row," says Gavan James, CEO of Nomad. "We are grateful to our fantastic Nomad staff, quality housing partners around the globe, and our incredibly loyal clients that have made this possible," James adds. 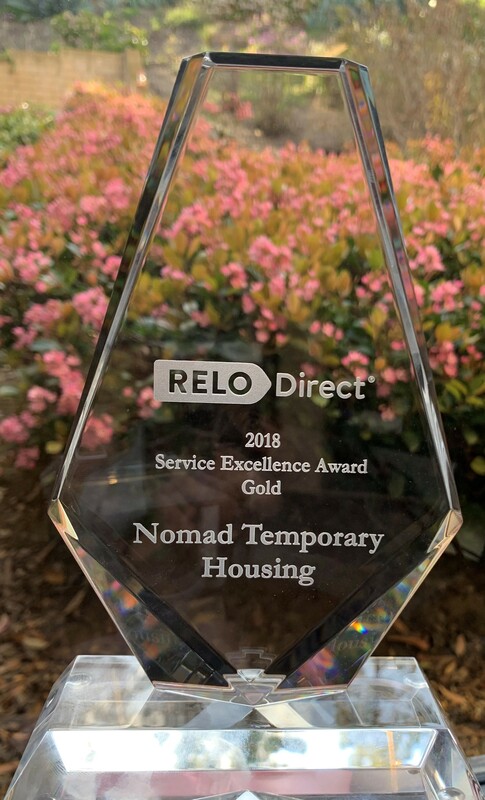 Earlier this year, Nomad Temporary Housing received a Gold Service Excellence Award from RELO Direct, and scored the top rating in the 14th Annual, Relocation Managers' Survey© conducted by Trippel Survey & Research, LLC. Nomad is ranked #1 in Overall Satisfaction, Net Satisfaction, Loyalty, Innovation and Partnership, and Willingness to Recommend. Nomad has also received this top ranking, two years in a row. Further, Nomad has also received numerous other service awards from our valued clients in the last twelve months. LONDON, Nov. 28, 2017 /PRNewswire/ -- On Friday, 10 November, 2017, The Forum for Expatriate Management (FEM) announced Nomad Temporary Housing, the premier global provider of temporary housing, as the 2017 Expatriate Management & Mobility Award winner for the EMEA region in the Corporate Housing Provider Category. Nomad also won in this category in May 2017 for the Americas region. Karl Thuge, Partner and EVP at Nomad states, "Nomad is humbled to receive this recognition from our global peers in the industry. While our service model was built upon cutting edge technology, we continue to invest in our 'high touch' customer approach. This award is confirmation of what so many of us in relocation understand; high tech and high touch are not mutually exclusive." The FEM EMMAs are the premier awards for the global mobility and HR industry around the world, bringing together global mobility's brightest and best in EMEA for this specific event. All award submissions are judged by a panel of independent experts against a set of strict criteria, who noted that the standard of entries was very high yet again for 2017. One judge remarked about Nomad's aggregator model "A really unique market proposition, and one which will save money for clients via their mini auction methodology…..Hugely impressed by innovation-focused approach". The award follows Nomad's massive growth on a global scale, with clients embracing the aggregator model, and recognizing the abilities it has in the worldwide marketplace. Trippel Survey & Research, LLC conducted its fifteenth annual survey to obtain evaluations from corporate relocation managers regarding their level of satisfaction with temporary housing service providers. For the second year in a row, Nomad Temporary Housing achieved the highest average survey score, rating higher than all other national and regional temporary housing brands. Nomad is also the only brand with all survey scores in the 8 – 10 range, on a scale of 1 – 10. In addition, Nomad has also scored at the top of the Trippel survey in Net Satisfaction for 2016 and 2015. 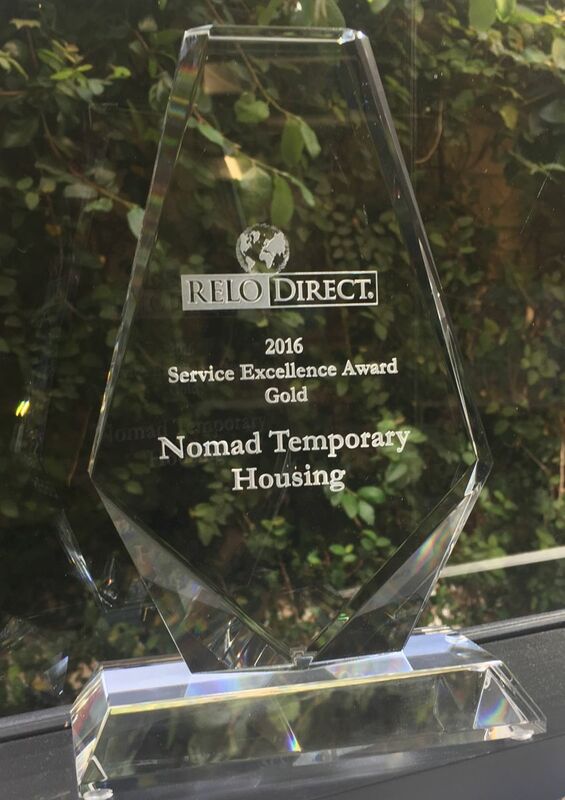 RELO Direct, at its recent 7th Annual Corporate Forum Event, honored Nomad Temporary Housing with a Gold Service Excellence Award. Nomad has provided temporary accommodations for RELO Direct and its valued clients for more than six years in locations all over the globe. "At the core of everything RELO Direct® does is a commitment to meeting and exceeding the expectations of our clients and their relocating employees," said Oliver Dubester, Director, Global Supply Chain Management. "In order to achieve that, we must partner with the best supplier partners available since they act as an extension of our own organization. Throughout our relationship, Nomad Temporary Housing has shared this vision for service excellence and we are grateful to be aligned with them." Nomad won the Platinum level service award from Brookfield at their supplier forum in Washington DC!! SAN DIEGO, Nov. 1, 2016 /PRNewswire/ -- Nomad Temporary Housing was awarded the 2016 Platinum Premier Service Award at the recent Brookfield Global Relocation Supplier Forum in Washington D.C. Nomad was one of eleven global suppliers to be honored at the platinum service level, and was the only organization in the temporary living service line to earn such recognition. Brookfield notes the following: "With an ongoing focus on total commitment to quality, Brookfield has continued to collaborate with our supplier partners to enhance performance management and innovation, optimize mobility spend and mitigate risk. Congratulations to our 2016 award winners who have gone above and beyond to demonstrate their commitment to excellence." 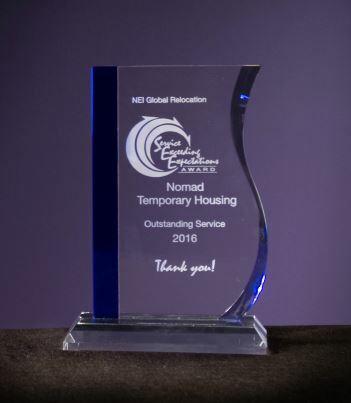 Nomad Temporary Housing Awarded Service Exceeding Expectations Award by NEI Global Relocation! Nomad Temporary Housing named Corporate Housing Company of the Year! 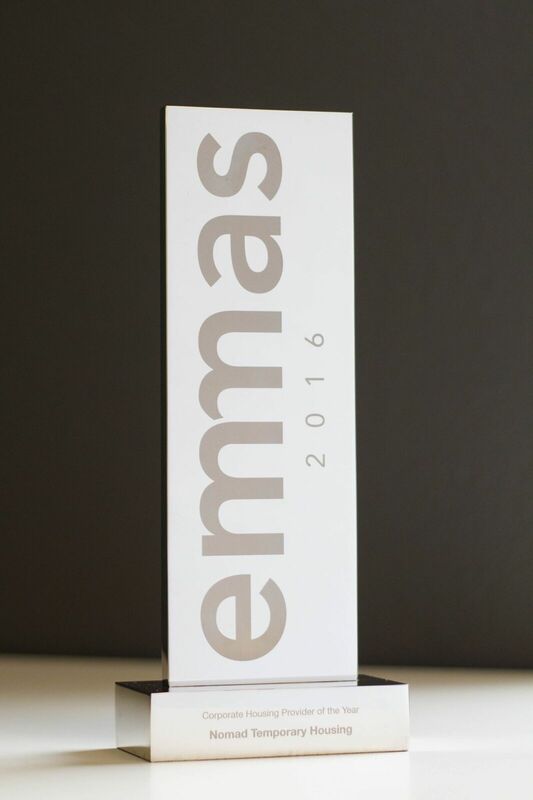 SAN DIEGO, May 11, 2016 /PRNewswire/ -- Nomad Temporary Housing was awarded the 2016 Corporate Housing Company of the Year at the recent "Emma Awards" held in Philadelphia, Pennsylvania. The Forum for Expatriate Management (FEM) holds the Expatriate Management and Mobility Awards annually. 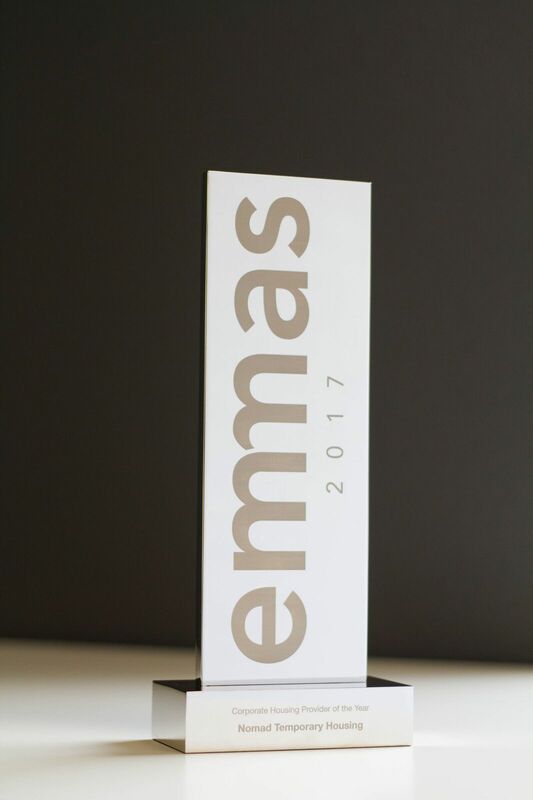 "We are thrilled to win a prestigious Emma Award," says Gavan James, founder, president and chief executive officer of Nomad. "This is another affirmation of Nomad's superior service, and unique unbiased model. We would like to thank our incredible staff and over 700 quality worldwide housing brands that contribute to our industry leading results." 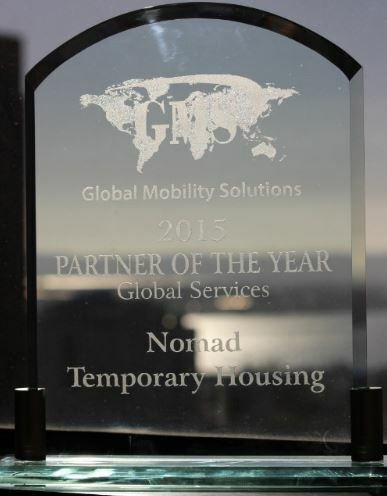 SAN DIEGO, March 1, 2016 /PRNewswire/ -- Nomad Temporary Housing was awarded the 2015 Global Partner of the Year at the recent Global Mobility Solutions Supplier Forum in Scottsdale, AZ. Hundreds of suppliers gathered for educational sessions and to celebrate another amazing year serving GMS. The true collaboration between Nomad and GMS has been integral to the success of the partnership. Says John Fernandez, Vice President, Global Services, "Since bringing Nomad into the Network, we have experienced record breaking conversions and satisfaction. Nomad's commitment to excellence is the perfect complement to our model. Thanks to all at the Nomad Team for a record breaking year." 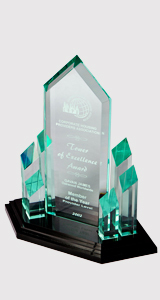 Nomad Temporary Housing Wins Superior Quality Service Award From Graebel Relocation Services Worldwide! 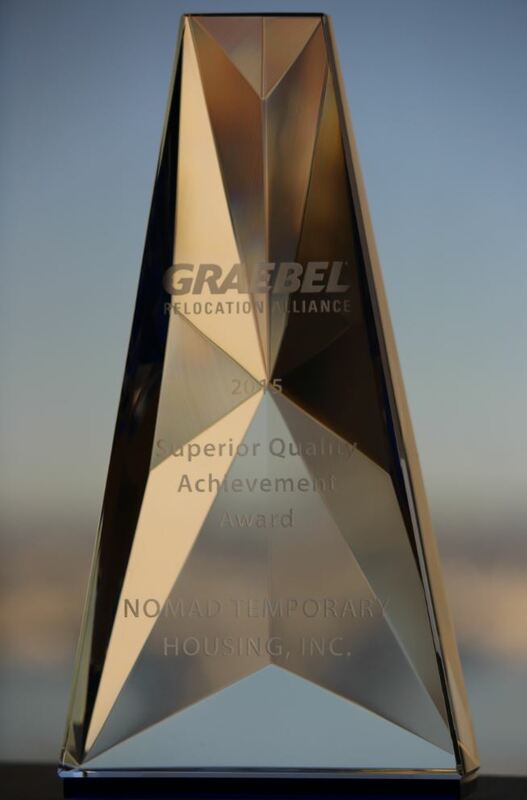 San Diego, CA (November 2, 2015)-At its recent 15th Annual Graebel Relocation Alliance Conference, Graebel honored Nomad Temporary Housing with the award for Superior Quality Achievement as chosen by guest/transferee. Nomad provides temporary accommodations for Graebel and its valued clients in locations all over the globe. 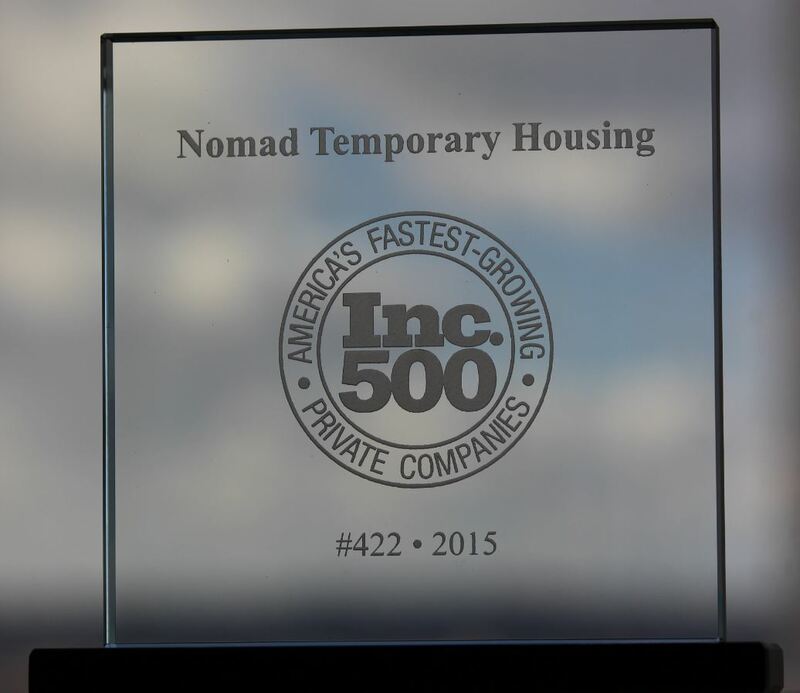 Nomad Temporary Housing is proud to announce Inc Magazine listed Nomad Temporary Housing #422 on its 34th annual Inc 5000, an exclusive ranking of the nation's fastest-growing companies. The list represents the most comprehensive look at the most important segment of the economy—America's independent entrepreneurs. Companies such as Yelp, Pandora, Timberland, Dell, Domino's Pizza, LinkedIn, Zillow, and many other well-known names gained early exposure as members of the Inc. 5000. 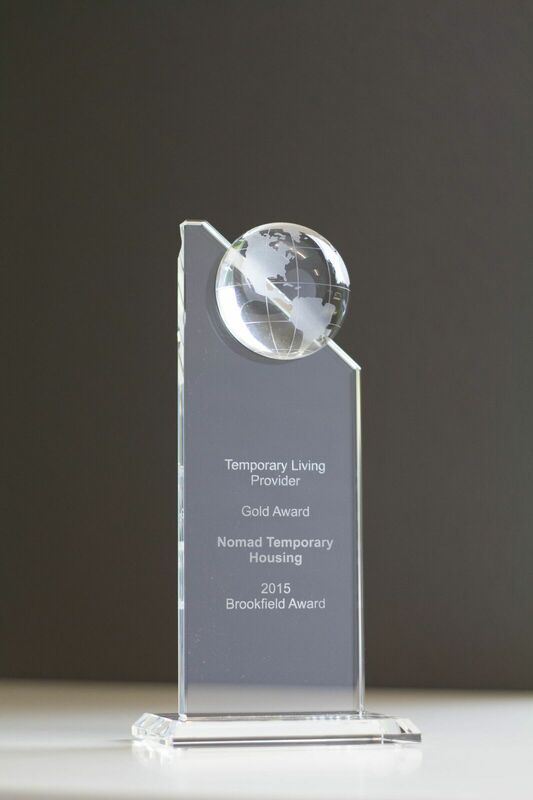 Nomad Temporary Housing is the proud recipient of the Gold Premier Service Award for Temporary Living from Brookfield Global Relocation Services. Out of more than 2,800 global supply chain partners, Nomad was the only company in the field of temporary living to be singled out for this honor. A strategic partner for Brookfield for the past three years, Nomad has consistently maintained extremely high service scores throughout their business relationship and through very high volume time periods. Cindy Salter, Executive Vice President, Brookfield, states, "Critically important is their cost and margin transparency. Thank you very much, Nomad!" Nomad Ranked Highest in Five Service Categories! According to the 13th annual 2015 Relocating Manager's Survey, conducted by Trippel Survey & Research, LLC, Nomad achieved the highest average score in Overall Satisfaction, Net Satisfaction, Loyalty, Willingness to recommend, and Innovation in Partnership of all USA temporary housing firms. This survey is sent to hundreds of U.S. corporation relocation managers. Nomad is widely recognized as having the only unbiased Choice Model, which consolidates the widest array of choices in each market, with the umbrella of service of one single firm. According to the 2012 National Relocation Survey, conducted by Trippel Survey & Research, LLC, Nomad was ranked #1 in Net Satisfaction amongst all national temporary housing companies in the USA. At the 2012 Tower of Excellence Awards event for the Corporate Housing Provider’s Association, Nomad Temporary Housing was one of two firms that won the coveted "Most Creative Marketing" award. Nomad earned the award due to its revolutionary, unbiased temporary apartment model that combines the unbiased choice of 74,000 temporary apartments with the full service of a single company. 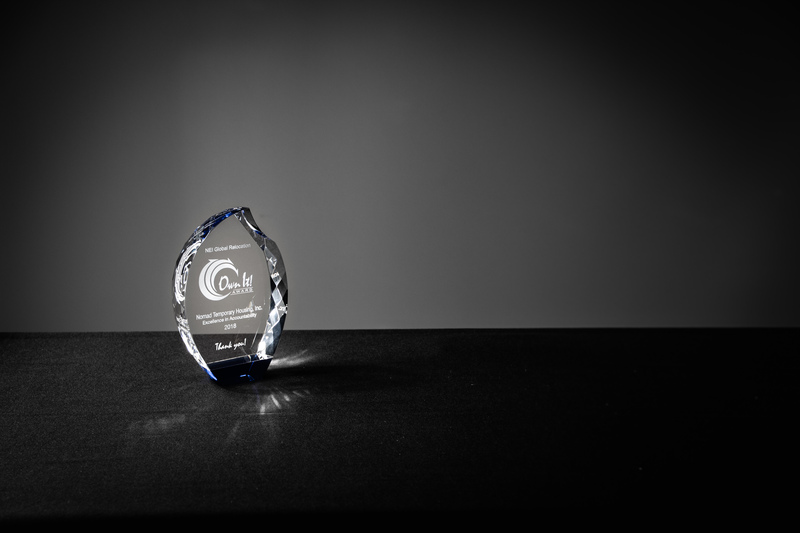 Further consideration for the award was given for Nomad’s clean website design, innovative option delivery presentations, and overall sales success. Gavan James, Nomad Temporary Housing Founder and Chief Executive Officer, said “This award is the result of a combined effort of the Nomad team, Jacob Tyler Creative Group of San Diego, CA, and numerous large users of temporary housing who contributed to the formation of our business model. After our first year of business, the marketing efforts of Nomad resulted in capturing the business of over 25 international relocation management companies, and over 300 Fortune 2000 clients." Heather James, Nomad Partner and Vice President of Business Development, was in attendance with Mr. James to receive this award. “It was thrilling to be recognized and exciting to win,” adds Heather. “Our customers are benefitting every day from our delivery model of unbiased choices, which have aggregated the industry.” Karl Thuge, Nomad’s third Partner and Executive Vice President, adds “Nomad has created a new way for clients to gain access to a fragmented industry. We are honored to win." 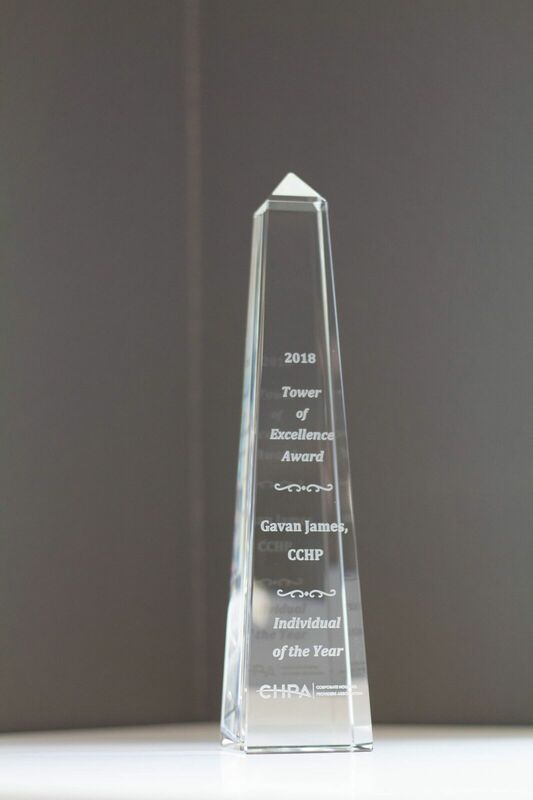 Gavan James, Nomad Temporary Housing’s founder, president and CEO was tremendously honored to be the recipient of the very first “Person of the Year” award from the Corporate Housing Provider’s Association (CHPA) in 2003. Gavan received the award at CHPA’s annual international conference in recognition for his contribution and leadership in developing the temporary corporate apartment industry into the $2 billion hospitality segment it has become today. In addition to founding Nomad, Gavan was a long term senior executive managing the worldwide operations of Oakwood, a global leader in the temporary housing industry. Gavan also was recognized as a founding board member of CHPA, past president, regular speaker, and contributor of the industry’s trade organization. Nomad Temporary Housing encourages all associates to serve in our industry and community. Our founder, Gavan James, has always led by example, and served two consecutive terms as president of CHPA, which was named the Association of Interim Housing Providers “in the early days” of the organization. 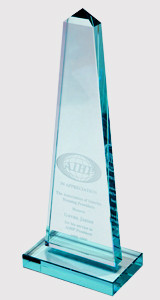 Gavan was honored to receive this award and recognition at CHPA’s annual international conference.